The increasing significance of machine learning explains why AI was one of the biggest topics of the recent Google I/O conference. This annual developer festival highlighted the range of possibilities offered by AI: Google Assistant, for instance, which now connects one hundred million devices and is on hand to help you make the best decisions at home and on the go – whether through your TV, Google Home and wearable devices, or your car. What’s interesting is that conference highlighted many of the ways AI can function as a co-pilot, both personally and professionally – fitting a buyer’s brand experience to the contours of their everyday, real-time activities; educating them, for instance, on what a nearby shop offers with the click of their camera (via Google Lens). In the past, it was common for buyers to be forced through predetermined paths created by marketers and salespersons. While having a few paths adds a certain degree of personalisation to the experience, this method does not make the cut or tick the boxes of what customers are expecting from a brand. In order to differentiate themselves and make the cut as buyers’ favourite brands, companies now need to focus on delivering the right type of message, to the right type of person, at the right time and through the right channel. By increasing the number of channels available, and adding new ways to reach customers, AI is modelling a new kind of customer experience – and one that marketers should take note of. Today’s buyers require a new approach, as 78% of purchasers now start the buying process with a web search, and at least 50% turn to social media and peer reviews to glean insight about a particular product or service. The internet is the opportunity for marketers to learn more about how customers choose to interact with a brand online, what makes them tick and what kind of messaging is received the best. Marketing automation tools are the key to collect all of this information and tie it back into a marketing and sales process. AI could be the co-pilots that marketers need to guide them in building the best customer journeys, and help them to adjust their strategy, in real-time. 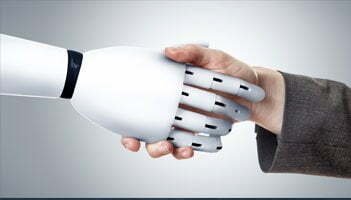 Although machine learning and data are frequently at the heart of the conversations, and mentioned as something we should be wary of, this could mean the end of the one-size-fits-all targeting for customers, and of poor proactive attempts to contact them coming from brands. Machine learning, applied in the right way, could offer more personalised, targeted and relevant experiences, delighting customers along the way — and freeing up time for those who represent the brand so they can be there for customers when the more human and authentic interactions are needed. We believe marketers of the future will build ‘adaptive journeys’, with AI applied intelligently throughout the customer journey online, ultimately creating a better experience for everyone. The best techniques to improve customer journeys?